Here’s to a new month and new possibilities. I am feeling perky this morning because I have written out all of my July accomplishments and August goals . It is important to keep of all of your goals so that you can measure your progress. Remember, you can’t manage what you DON’T measure! The same here for blogging. I am happy because I have just learned how to monetize my blog. It hit me when I am writing down my accomplishments. There is this formula that I have uncovered for getting new jobs, interviews and opportunities. I have to write it down because I 1) want to capitalize upon it and 2) don’t want to reinvent the wheel. 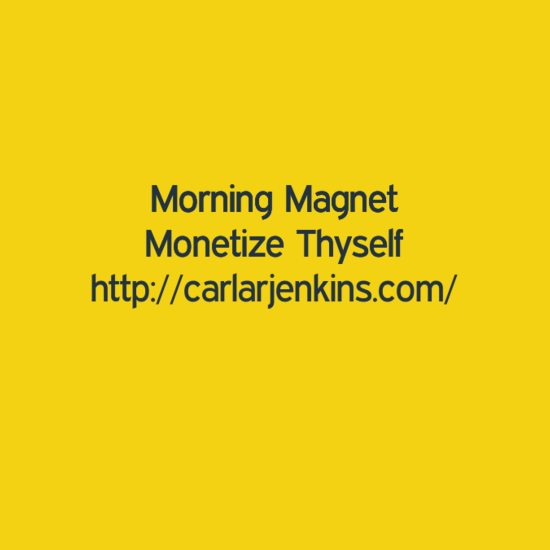 Monetizing is essential for any blog or business to survive. I have been blogging first on PositivityChange.com since July 31, 2015. I have been blogging on another site since 2004 but that was just my thoughts not anything business or money-related. That site has helped me find my point of view and is the place where I do all of my eBay stuff. I am just glad that I have kept writing my best articles over this two-year period. Putting forth your best work makes it that much easier when people start paying you because you have a treasure trove of rich blogger content to pull from. From August onward, I am focusing on monetizing my content and products. I will start working on giving people more reasons why to read and purchase my products. I also have so many great things lined up for all of my readers. August will be the start of something big! Need help planning, prioritizing and organizing your time, people and money? Let’s talk. Shop my carlarjenkins.selz.com store for the best in business products and services! Good luck with your monetizing goals! Thanks for sharing at The Blogger’s Pit Stop!